Two highly significant 18th century maps of Asia on a single sheet. Geographica Nova ex Oriente Gratiosissima, Duabus Tabulis Special. contenta, quarum Una Mare Caspium, Altera Kamtzadaliam, seu Terram Jedso. 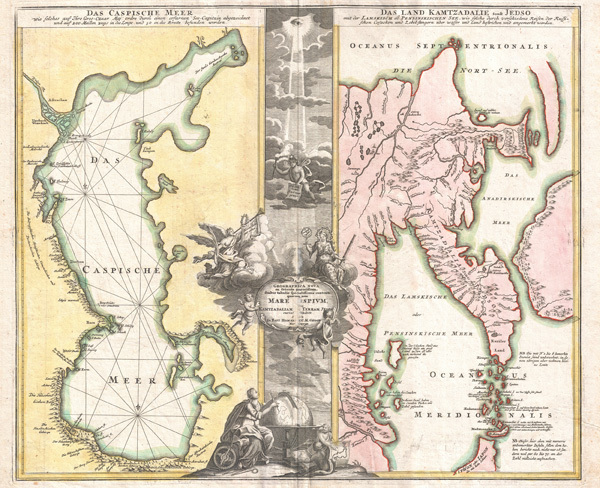 One of Homann's most interesting and influential maps, this 1725 map depicts the Caspian Sea and the Peninsula of Kamchatka. Essentially two maps in one, Homann here juxtaposes two opposite parts of Asia: the Capsian Sea, which forms part the western border of Asia and Europe, and the Peninsula of Kamchatka, the easternmost known point in continental Asia. While this combination may seem odd to us today, to the 18th century European, reared on the works of Marco Polo and steeped in the legends of wealth associated with the orient, it represented the legendary Silk Route across Asia as well as the eastern and western most claims of the expanding Russian Empire. During this period, both the Caspian Sea and Kamchatka were actively being explored by European powers eager to exploit the riches of Asia. The left hand map, focusing on the Caspian Sea, marks a significant step forward in the mapping of this region, reflecting the 1719 - 1721 survey work of the Russian navy officer Karl van Verden. Verden's work, completed shortly before this map's publication was the most advanced mapping of the Caspian sea to date, offering a new perspective on the region and opening the navigational possibility of the world's largest lake. The right hand map depicts Kamchatka. Though only tentatively explored at this point, Russian forces under Vladimir Alassov took control of the peninsula in 1697. In the process they stumbled upon a small colony of Japanese shipwreck survivors, a discovery that lead the Russians to speculate that Kamchatka was one and the same with Yedso (Jedo or modern day Hokkaido), the northernmost part of Japan. Homann's timely map of the region thus had a significant impact on subsequent cartography of the region. Most importantly Homann's map influenced Engelbert Kaempfer's 1727 History of Japan which laid the ground work for European cartographic representations of Japan for the next 50 to 60 years. Subsequent maps of Japan would incorporate the mythical island of Matsumai (shown here as Matmanska) into a small archipelago joining Japan to Kamchatka - thus placing part of the prized Japanese island chain in the sphere of Russian, hence European, influence. East of Kamchatka there appear two large bodies of land. These mythical landmasses reflect speculation associated with the connections between Northeastern Asia and Northwestern America. Many early maps incorporated these islands, often called Compagnie Land, Terre de Compagnie, Gamaland, or just Gama. Though not labeled as such on this map, there is no doubt this land is what Homann is attempting to represent. Compagnie was supposedly discovered by the mysterious sailor Jean de Gama in the 17th century. Most likely this territory is, like Muller's Peninsula, merely a misinterpretation of numerous sightings of the various Aleutian Islands. The two primary panels of this map are separated by an unusual band of allegorical cartouche work. From on high the sun gazes down upon the lands of men and gods - much as the cartographer might have imagined himself looking down upon the world. Cherubs, angels, and cosmic figures hold aloft the instruments of cartography. At the base of the cartouche a man sits next to a globe, his mapping tools at hand. The globe itself is set to Asia with both the Caspian Sea and Kamchatka set recognizably in context. One of the most interesting elements of this cartouche is the small map of Japan being held by a child in the lower right. Though tiny and a seeming minor element, this little map is actually the first of a serious of important representations of Japan in which the Noto Peninsula is turned westward. This cartographic convention did not begin to appear in actual maps until Bellin's 1736 mapping of Japan. All in all a highly significant map of two fascinating parts of Asia and an important addition to any serious collection focusing on the early mapping of either the Caspian Sea or Japan. Published in 1725 by J. B. Homann of Nurembourg, Germany. Very good. Original centerfold. Some wear in title area. Else clean. Pierce, B., A Catalogue of the Maps and Charts in the Library of Harvard University in Campridge, Massachusetts, p. 168.